A couple of years ago I was laying poor Ruthie Sue Payne to rest as the undertaker of Eternal Slumber Funeral Home. It'd been determined that Ruthie had fallen down the steps of the Sleepy Hollow Inn Bed and Breakfast since she not only co-owned it with my Granny, Zula Fae Raines Payne, but also lived there. As you can see, my Granny and Ruthie share the same last name since they shared the same deceased husband. Yep. Granny stole Ruthie's ex-husband, as Ruthie sees it. When he died, he left them both the inn. Can you imagine? Regardless, poor Ruthie had expired and it was her turn to meet the big guy in the sky. I had a hankering for lunch at Artie's Meat and Deli while I was fixing Ruthie's casket in the prettiest window of the funeral home when I decided to walk down the street to get my lunch. We'd just had a big snow storm but today was unbelievably warm and all the snow was melting off the boutique stores in our little town of Sleepy Hollow, Kentucky. Like any other shop, Artie's was all decked out for Christmas and the big plastic Santa sat right on top of the deli roof. Just as I was walking up to the deli, that Santa slid off and whacked me in the head leaving me with a gift I can't give back....the gift of seeing dead people. Not just any dead people. Murdered dead people. And there was Ruthie Sue Payne standing next to me in her housecoat and kitty-cat slipper, claiming she was murdered! A couple of years later and now my gift, Betweener ( I help people get between here and there), it's not just limited to the people in our small town. Now I've got a little girl and a cat that appears to have had some trouble in the world of the living and breathing. If that wasn't enough to keep me busy, Jack Henry Ross my boyfriend and local sheriff has taken a six-month job with the Kentucky State Police. Unfortunately, he's the only one that knows about my Betweener gift. . .at least that's what I thought. Welcome to the south where secrets don't stay for very long. 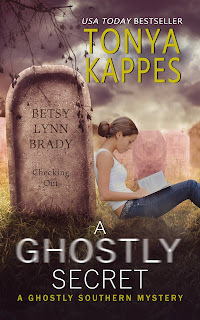 . .
Read Chapter One at Tonyakappes.com under the Front Porch Sittin' Tab! Have you read any of my southern cozy mysteries? 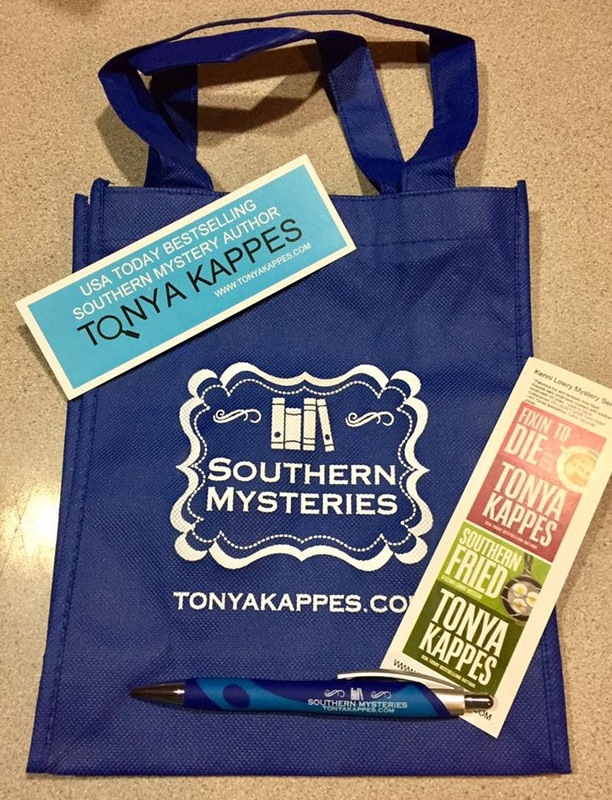 Leave a comment to win a print copy of A GHOSTLY SECRET AND SOUTHERN MYSTERY TOTE BAG!!! To celebrate the release of A GHOSTLY SECRET, the 7th book in the Ghostly Southern Mystery Series, I'm giving away either a measuring spoon or Southern Mystery tote. Be sure to scroll down and fill out the form and head over to my website, tonyakappes.com, under the Front Porch Sittin' Tab to be entered to win. Sounds like a fun read, thank you for the giveaway! Yay! I've read many of your books on Kindle or on my computer but never had one in hand. Would love to win it and actually own a physical book from you. Thanks for the contest. This book was great! I love this series and can't wait to read this. Thanks for the chance. It's been so much fun writing in it. Very fun! I've really enjoyed Emma Lee and the gang. This looks like a great read! Thanks!!! I have all the other books I haven't bought this one yet. Can't wait to read it! This is an entertaining series. I have read your coffee shop series but haven't started this one yet. I love this series! 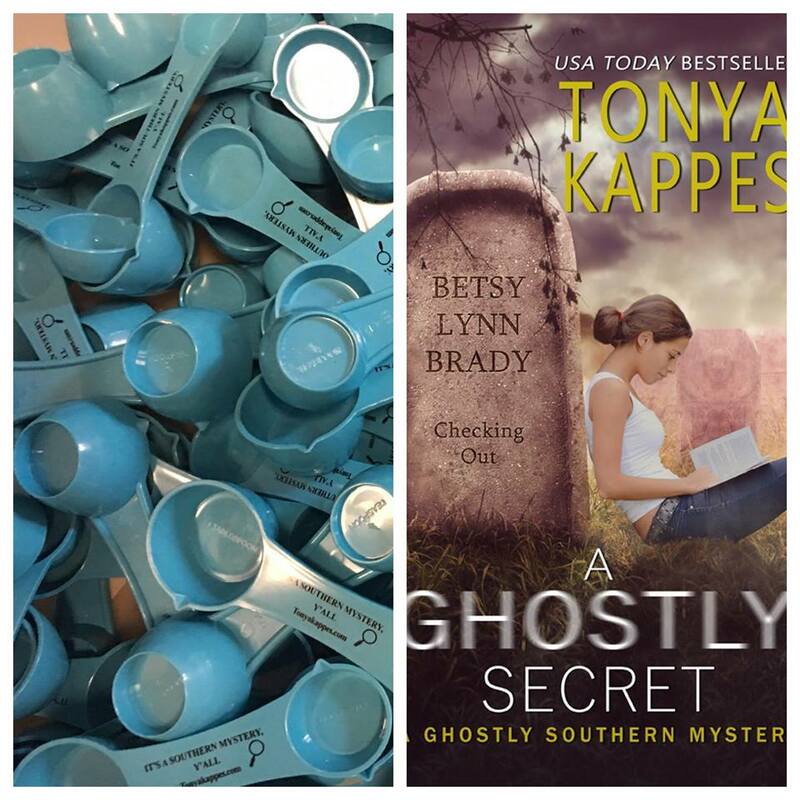 I'm looking forward to reading "A Ghostly Secret" when it comes out in paperback. This is such a fun series,love the characters. This sounds like an awesome book! Thanks for the chance! Fun series - thanks for the chance to win the latest. I just finished the first 6 books in the series and I cannot wait to read this one. It is one of my favorite series. I've read some of the Magic mysteries, the new coffee mysteries, Spies and Spells and one of the ghost mysteries, all ebooks, would love paperback!! I love the Cover and thank you so much for the contest. Please enter me. Congratulations on the new release! It sounds like fun. Best of luck! I read A Ghostly Undertaking. I LOVED it! Happy almost release day! Thank you so much for the chance to win!